Find Box Tops on everyday items in your home! Look for the pink square – each one is worth 10 cents to Aprende! Throw away expired Box Tops! They don’t count in our contest totals and we don’t get any money for them, either! Group your Box Tops in groups of 10 or 50 using a Ziploc bag. Be sure to label your baggies with your student’s name, grade & teacher! Any class that turns in at least 250 BoxTops will win an ice cream sandwich party. All students that turn in BoxTops will be entered into a raffle to earn a $5 gift card to Dutch Bros. One winner picked per grade. Are you a Box Tops member? 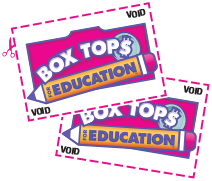 Sign up at www.boxtops4education.com to stay updated on our school’s earnings and find a full list of over 250 participating products. Members also receive exclusive coupon offers and recipes and can learn about extra ways for our school to earn more cash. If you have any questions, please don’t hesitate to contact boxtops@aprendeptso.org.